With the warm weather season comes frequent thunderstorms and even the occasional hurricane. 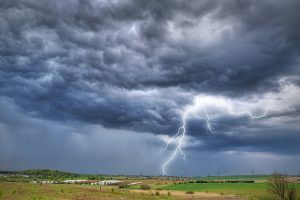 Is your HVAC system ready to handle severe weather? If you’re not sure, there are some steps you can take to make sure your air conditioner is prepared. When a storm catches you off guard, you could find yourself making an emergency call to your heating and cooling company. Don’t get stuck without AC after a storm by following these tips. Turn off the power to your HVAC system from your circuit breaker box. When you know a storm is coming, no matter how minor, turning off the power to your air conditioner can save the electrical components from a power surge. When lightning strikes anywhere near your home it can cause damage to your electrical appliances. Cutting off the power prevents this. If you have a window unit or portable air conditioner, unplug it from the wall. Check your backup generator. In case you lose power during a storm, make sure your backup generator is working properly. Once the storm passes you may need backup electricity until the power company can get power restored to your area. If you haven’t used your generator in a long time, it’s possible that it may not be in proper working order. Cover your outdoor unit. To protect your outdoor unit from damage due to blowing debris, cover it with a tarp or cover of some kind. Make sure the power is off to your HVAC system first. Clear out the area around your AC unit to eliminate as much debris as possible that could blow into your system. After the storm, check your HVAC system before turning it on. Do not turn on your air conditioner right after the storm passes if you haven’t checked the outdoor unit for damage. You may need to clear out debris that has blown against the unit. If there are any dents or obvious problems, call your heating and cooling company before using your system. Make sure your HVAC system is prepared for severe weather by scheduling a tune up in early spring. An AC tune up, also known as preventative maintenance, involves inspection, cleaning, and repairing your system. The inspection turns up any potential problems that need to be addressed so that repairs can be done before an emergency occurs. A thorough cleaning helps your HVAC system to run as efficiently as possible. Electrical components are checked to be sure nothing is loose or worn out. Your air conditioning will be ready to weather the storm after a detailed tune up. The best time to schedule maintenance is early spring before the weather gets hot and before technicians get busy responding to emergency AC calls. Be prepared for severe weather. Schedule maintenance now with Alamance Oil: (336) 226-9371.